Haochen Zhang on piano. Photo provided by HaochenZhang.com. Sergei Rachmaninoff was one of the most innovative composers of his time. This is seen in his Piano Concerto No. 2. The piece starts with a melancholy movement that alternates between sad sweetness and darkness. It continues on in a sense of longing and finally with a triumphant ending. This piece of music is compelling and stirs up deep emotions. The concert was beautiful and compelling. The featured pianist on this concerto is Haochen Zhang. Zhang is a very young man but plays with the depth and power of a very old musician. 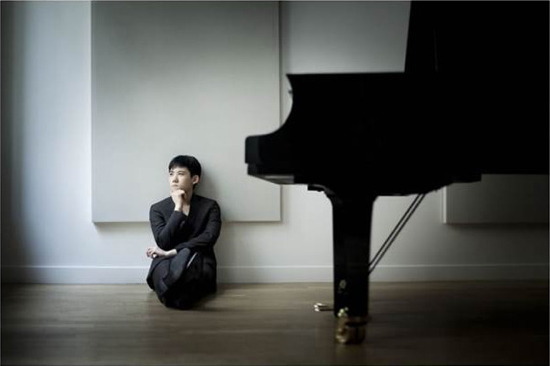 He plays with a gentleness and ease, effortlessly flowing throughout the sporadic shifts within Rachmaninoff’s score. Zhang returned to the stage for a contemplative and sweet encore which truly showed off his excellent prowess. The program also included Antonin Dvořák’s Symphony No. 8 in G Major. This was a wonderful companion to the Rachmaninoff. The first movement was one full of power and felt like a battle. The second movement was smooth and floaty and then the third felt like a joyful pastoral dance. The final movement was a rousing climax for an incredibly complex piece. The orchestra was under the direction of their Music Director, Maestro Piotr Gajewski. Gajewski conducted with no score, displaying his excellent depth of knowledge and ability. He emanated pure joy as he led the orchestra and his hearty smile shaped his demeanor and, certainly the tone of the music. The concert was beautiful and compelling. Both pieces stirred many emotions and both felt like a battle between good and evil or light and dark. The National Philharmonic has a wonderful program called “All Kids, All Free, All The Time,” which ensures that all children from ages 7-17 have access to their concerts at no cost. This is a wonderful tool for exposing the next generation to classical music. Rachmaninoff’s Piano Concerto No. 2 will run through Jan. 29 at The Music Center at Strathmore. For tickets and more information click here.